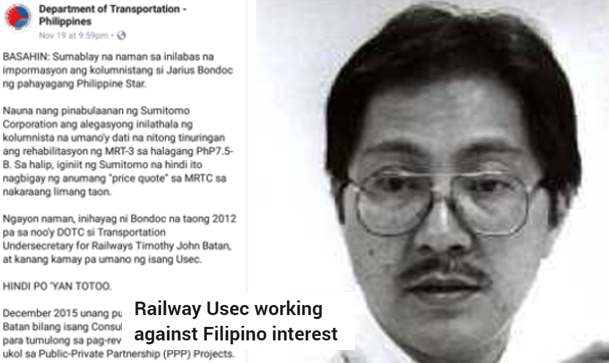 Home / News / Opinion / DOTr reacts to Philippine Star columnist lies to mislead the public: "Railway Usec working against Filipino interest"
DOTr reacts to Philippine Star columnist lies to mislead the public: "Railway Usec working against Filipino interest"
The Department of Transportation issues it's statement at one of Philippine Star columnist named Jarius Bondoc. According to the article of Bondoc, he was pertaining to Undersecretary of Railways Timothy Batan where he was accused of being a "dilawan" official stalling the Mindanao Railway project. The issue of Bondoc to Batan is the MRT-3 that remains the same, accusing Batan of P7.5-billion plan with Sumitomo in Nov. 2017. The columnist interview snub by the USec. On Bondoc's column in Philippine Star, he mentioned that Batan had been badmouthing him and was always snubbing his interview request. Bondoc said that the Filipino people are repaying the P18 billion that he’s borrowing, no details given, for the rehab. The money will go to the repairs of defective trains from China that Batan was the one responsible for the projects with Sumitomo. According to Bondoc, Sumitomo denied knowledge of the P7.5 billion for the rehabilitation of Metro Rail Transit Corp., MRT-3’s private builder-owner. Bondoc said that Batan has been with the DOTr since 2012 who signed contracts for MRT-3. MRTC’s P7.5-billion plan was first made when Batan’s boss was running MRT-3 to the ground with inept upkeep contractors. In fact, Batan rattles off those same documented items in his press releases. Except that, he leaves out the quoted amounts: $98 million + $53 million = P7.5 billion. Then Bondoc said, a public official said to Sumitomo, “Look, your old rep gave us this rehab plus maintenance figure, P7.5 billion, in 2015-2017. If we deal directly with you, what are your price details for each work item?” Then he would have published it for transparency in government transactions. Batan instead refuses to break down his P18 billion. Like, what goes into track replacement, overhead catenaries, stations and depot, overhaul of 73 LRVs, and maintenance. What is he afraid of – that railway experts in the Philippines and abroad would discover and point up overpricing? If that’s true, Batan must show documentary proof. No one wants to sign certifications of safety tests, buyer satisfaction, acceptance, and contract completion. The trains did not meet 2013 contract specifications. Anyone who now signs those certificates will go to jail. DOTr backs USec Batan against the claims of Philippine Star columnist. 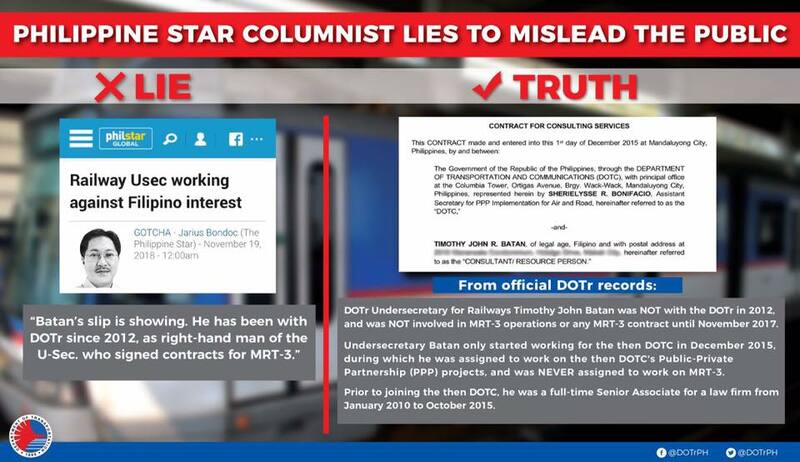 In a Facebook post of the Department of Transportation, Bondoc's articles was pure allegations and lies. Contrary to Bondoc's statement that Batan has projects in the MRT since 2012, where in DOTr clarifies that USec. Batan was with the government agency since 2015 only. The column of Bondoc was to mislead the public and ruin the reputation of the DOTr. "BASAHIN: Sumablay na naman sa inilabas na impormasyon ang kolumnistang si Jarius Bondoc ng pahayagang Philippine Star. Nauna nang pinabulaanan ng Sumitomo Corporation ang alegasyong inilathala ng kolumnista na umano'y dati na nitong tinuringan ang rehabilitasyon ng MRT-3 sa halagang PhP7.5-B. Sa halip, iginiit ng Sumitomo na hindi ito nagbigay ng anumang "price quote" sa MRTC sa nakaraang limang taon. Ngayon naman, inihayag ni Bondoc na taong 2012 pa sa noo'y DOTC si Transportation Undersecretary for Railways Timothy John Batan, at kanang kamay pa umano ng isang Usec. December 2015 unang pumasok sa DOTC si Usec. Batan bilang isang Consultant/Resource Person para tumulong sa pag-review ng mga kontrata ukol sa Public-Private Partnership (PPP) Projects. Muling iginigiit ng DOTr na masusi ang prosesong pinagdaanan upang maitakda ang halagang PhP18-B para sa proyektong rehabilitasyon ng MRT-3. Nagkaroon ng comprehensive system inspection ang 150 Japanese at Filipino engineers mula Enero hanggang Abril nitong taon. Sinundan 'yan ng fact-finding mission ng Japan International Cooperation Agency (JICA), at nagsagawa pa ng loan appraisal mission. Hindi lang 'yan. Dumaan pa sa review and approval ng National Economic and Development Authority (NEDA) Investment Coordinating Committee (ICC) ang proyekto. HINDI MINAGIC ANG PRESYO NG PROYEKTO. 'Wag po tayong magpalinlang sa mga impormasyong hinugot kung saan-saan lang.